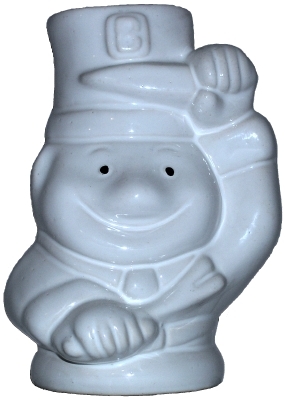 This mug depicts a chef, possibly a teppanyaki chef, holding a knife and a two-tined fork. On this cap is the raised letter “B”. On the back, in raised lettering, is “Benihana”. There are no other markings on this mug. There is an opening in the back for adding a beverage. Found in the Benihana, Labeled, Mug, and Orientalia Collections. This glazed ceramic mug depicts the likeness of Fukurokuju, the God of Wisdom and Longevity, one of Japan’s Seven Lucky Gods. He is often depicted as an old man with a long white beard and an unusually high forehead. In this depiction, he is wearing a robe and carrying a cane. You can see his feet peaking out from under the bottom of his robe. There is hole in his beard for a straw and a larger hole on the back for adding a bevarege. On his back, in raised lettering, is “Benihana of Tokyo” and on the bottom, printed in ink, is “Japan”. Similar mugs in my collection include the Dynasty Wholesale DW130 Jurojin mug. 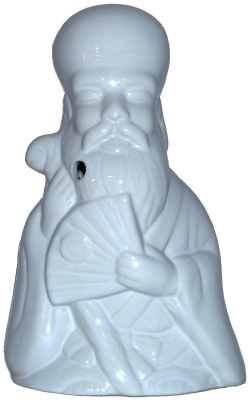 This white ceramic mug from Benihana depicts Hotei. 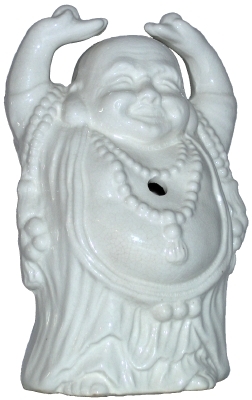 Hotei, one of Japan’s Seven Lucky Gods, is known variously as the God of Contentment and Happiness or the “laughing buddha”. He was an eccentric Zen priest of the late Tang dynasty in China who walked around collecting offerings with a huge bag. Rubbing his stomach is said to bring good luck. 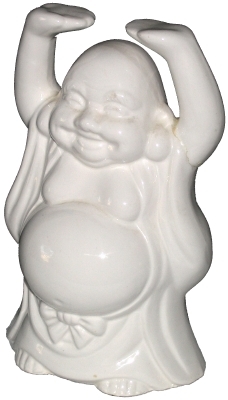 I aspire to be as happy and rotund as Hotei. On the back, stamped in ink, is “Benihana”. I have two Benihana Hotei mugs, this and another. These mugs look similar, however, this mug is smaller. Also, the belt is tied differently. Similar mugs in my collections include the Orchids of Hawaii R-95 Hotei mug and the Dynasty Wholesale DW123 Hotei mug. 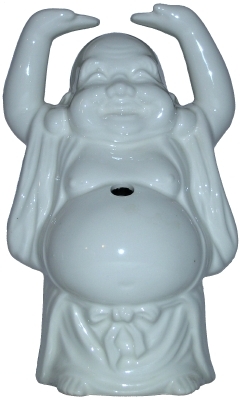 Found in the Benihana, Hotei, Labeled, Mug, and Orientalia Collections. On the back, stamped in ink, is “Benihana of Tokyo”. Inscribed on the bottom is “Japan”. I have two Benihana Hotei mugs, this and another. These mugs look similar, however, this mug is larger. Also, the belt is tied differently. 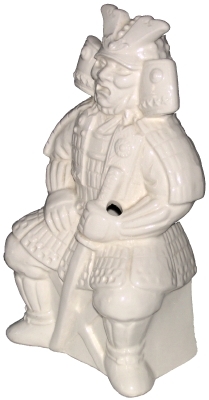 This glazed ceramic mug is nearly 9-inches tall and depicts a Samurai sitting on a crate. The samurai is wearing full battle dress and is holding a sword in his left hand. There is an opening in the back for adding beverage and a hole for a straw near the left hand. On the back is a plastic sticker that says “Benihana of Tokyo” and inscribed on the bottom is “Japan”. This mug depicts Tanuki, the Japanese God of Restauranters. Tanuki is holding a bottle of sake in his left hand and a promissory note for the sake in the other. 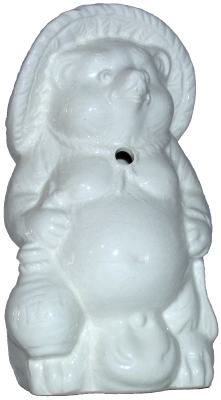 He has a big fat belly, large testicles, and is wearing a straw hat. Tanuki has the power of transformation which it uses to play tricks on people. It also loves sake, which is why it has a bottle of sake in one hand. There is an small hole in front of this mug for a straw and a large hole in the back for adding a beverage. Printed in ink on the bottom of the mug is “Benihana of Tokyo” and inscribed on the bottom is “Japan”. 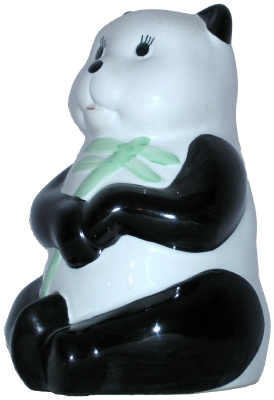 Similar items in my collections include an unmarked Tanuki Mug. 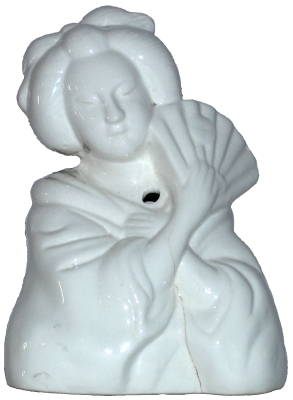 This white, ceramic mug depicts a Geisha holding a fan in her right hand. She is wearing a kimono and has a flower in her hair. On the back it reads “Ichiban” and on the bottom is “Daga ©” and “Hawaii”. This mug is similar to the Orchids of Hawaii R-22 Geisha mug, the Dynasty Wholesale DW121 Geisha mug, and an unidentified Geisha mug. Found in the Daga Restaurant Ware, Labeled, Mug, and Orientalia Collections. 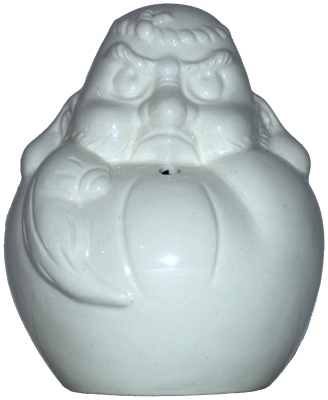 This egg-shaped, ceramic mug, depicting Daruma, the father of Zen Buddhism, has a moulded face of a man on the front, an opening on the back for adding a beverage, and a straw hole on the top. Found in the Mug and Orientalia Collections. 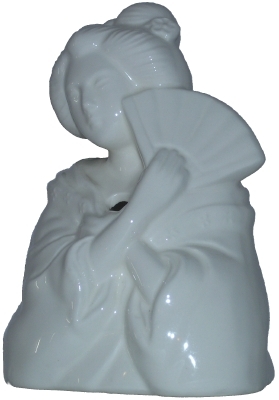 This white, ceramic mug depicts a Geisha holding a fan in her right hand. She is wearing a kimono and has a flower in her hair. There are no marks identifying the manufacturer of this mug. A gold-colored sticker on the bottom says “China”. This mug is similar to the Orchids of Hawaii R-22 Geisha mug, the Dynasty Wholesale DW121 Geisha mug, and the Daga Geisha mug. This glittering gold Maneki Neko is a coin bank. Maneki Neko translates to “Beckoning Cat” or “Welcoming Cat”. 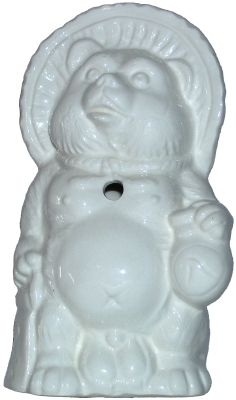 This Maneki Neko has its right paw raised which means it is inviting good fortune or money. If it has its left paw raised, it is beckoning customers or people. Also, like the Japanese and unlike Americans, Maneki Neko beckons with its palm forward. The color of Maneki Neko is significant also. In the case of this one, its gold color means it is inviting gold or money. 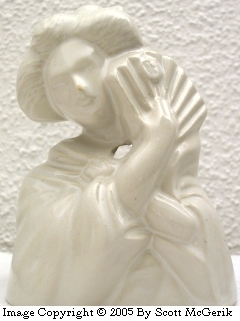 Other colors, such as white, suggest purity. Black Maneki Neko, unlike black cats, are wards against evil. Three-colored Maneki Neko are viewed as good luck charms. Found in the Figurine and Orientalia Collections. This 12 ounce, glazed ceramic mug depicts Hotei. On the bottom of the mug is “Japan” . This mug has a hole in the belly for a straw and an opening in the back for adding beverage and ice. Similar mugs in my collection include the Orchids of Hawaii R-95 Hotei mug, the Dynasty Wholesale DW123 Hotei mug, and the Benihana Hotei mug. Found in the Hotei, Mug, and Orientalia Collections. This 12 ounce, glazed ceramic mug depicts Hotei. There is extensive crazing on this mug. This mug has the most detail of any Hotei mug in my collection. On the bottom of the mug is “Japan”. This mug has a hole in the belly for a straw and an opening in the back for adding beverage and ice. Similar mugs in my collection include the Orchids of Hawaii R-95 Hotei mug, the Dynasty Wholesale DW123 Hotei mug, the Benihana Hotei mug, and an unmarked Hotei mug. 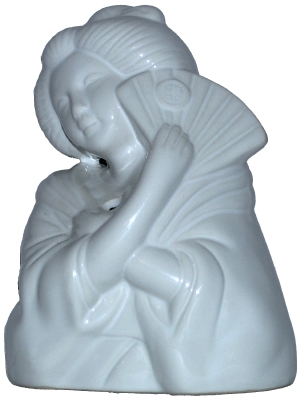 This mug depicts a Geisha who is holding a fan in her right hand and wearing a kimono. On the back it reads “Ichiban”. This mug is similar to the Orchids of Hawaii R-22 Geisha mug and the Dynasty Wholesale DW121 Geisha mug. Found in the Labeled, Mug, and Orientalia Collections. 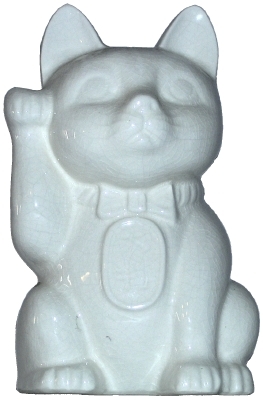 This white, ceramic Maneki Neko is a mug. Maneki Neko translates to “Beckoning Cat” or “Welcoming Cat”. 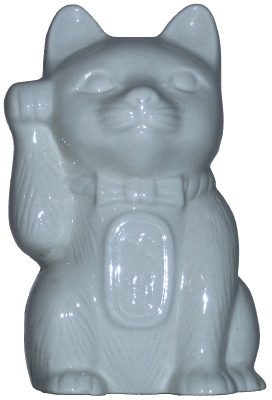 This Maneki Neko has its right paw raised which means it is inviting good fortune or money. If it has its left paw raised, it is beckoning customers or people. Also, like the Japanese and unlike Americans, Maneki Neko beckons with its palm forward. The color of Maneki Neko is significant also. 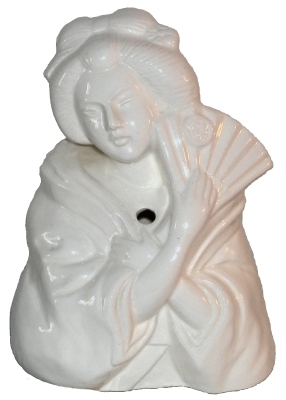 In the case of this one, its white color means purity. Other colors, such as gold, suggest gold or money. Black Maneki Neko, unlike black cats, are wards against evil. 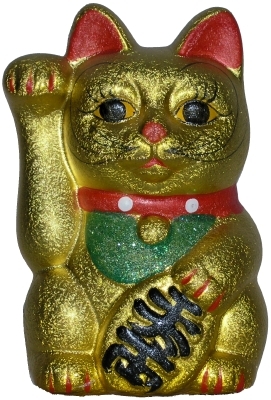 Three-colored Maneki Neko are viewed as good luck charms. There is a hole for a straw in on the right paw and larger hole on the back for adding a beverage. Inscribed on the bottom is “Japan”. The extensive crazing and that it was made in Japan suggests this mug is 30 to 40 years old. There is a hole for a straw in on the right paw and larger hole for adding a beverage on the back. Inscribed on the bottom is “Made in China”. This egg-shaped, ceramic mug, depicting Daruma, has a moulded, hand-painted face of a man on the front, an opening on the back for adding a beverage, and a straw hole on the top. The man has black, bushy eyebrows and a black mustache. 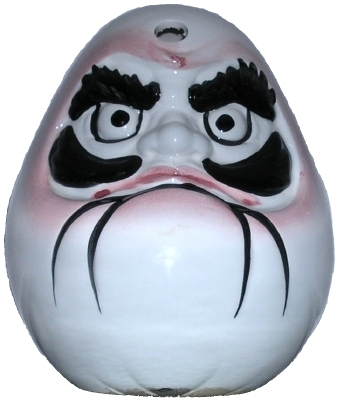 Daruma is the father of Zen Buddhism. This 12-ounce glazed, vintage ceramic mug is 6 1/4-inches tall. This mug depicts a Geisha who is holding a fan in her right hand, wearing a kimono, and has a flower in her hair. Geisha are traditional Japanese artist-entertainers who are trained in such skills as ancient Japanese dance, singing, flower arrangement, tea ceremony, calligraphy, and conversation. Geisha are not prostitutes, rather, they are professional entertainers. Inscribed on the bottom is “Orchids of Hawaii”, “R-22″, and “Taiwan”. This mug is similar to the Dynasty Wholesale DW121 Geisha mug, the Ichiban Geisha mug, the Daga Geisha mug, and an unidentified Geisha mug. Found in the Mug, Orchids of Hawaii, and Orientalia Collections. This vintage 13 ounce cream-colored mug stands 6 1/2 inches tall. 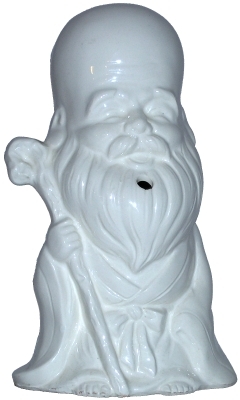 On the mug is a likeness of Confucious with a staff and a feather in his hand and a butterfly behind him. He is wearing a grey robe and a blue hat. On the bottom is “Japan” and “Orchids of Hawaii”. This vintage ceramic 12-ounce mug stands 7 1/2-inches tall. 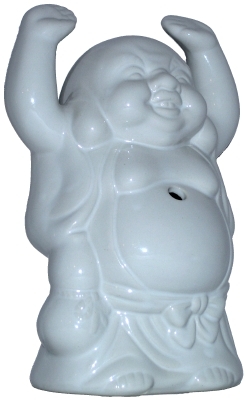 This mug is often referred to as the “Hotei” mug. Hotei, one of Japan’s Seven Lucky Gods, is known variously as the God of Contentment and Happiness or the “laughing buddha”. He was an eccentric Zen priest of the late Tang dynasty in China who walked around collecting offerings with a huge bag. 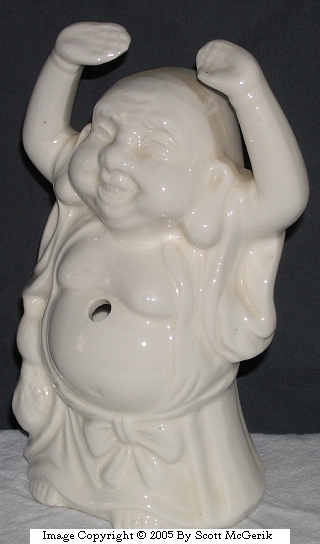 I aspire to be as happy and rotund as Hotei. Rubbing his stomach is said to bring good luck. On the bottom is imprinted “Orchids of Hawaii”, “Japan”, and “R-95″. Mugs similar to this in my collection are the Dynasty Wholesale DW123 Hotei mug and Benihana Hotei Mug. Found in the Hotei, Mug, Orchids of Hawaii, and Orientalia Collections. This 12 ounce, glazed ceramic mug from Orchids of Hawaii has a hole where the girl’s hand is for inserting a paper parasol. Inscribed on the bottom of the mug is “Orchids of Hawaii”, “R-96″, and “Taiwan”. 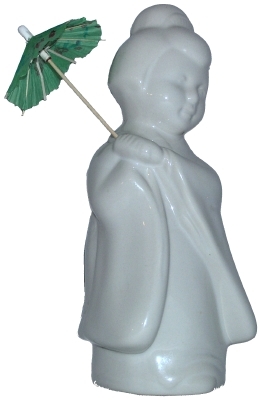 Similar items in my collections include the Dynasty Wholesale Dw122 Parasol Girl Mug. This vintage 13-ounce cream-colored mug stands 6 1/2 inches tall. 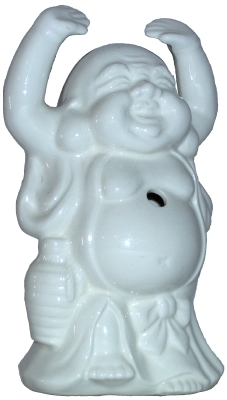 On the mug is a likeness of Buddha with a feather in one hand and a bag slung over his shoulder. He is wearing a grey robe. On the back appears to be Kanji script. On the bottom is “Japan” “R-97″, and “Orchids of Hawaii”. This vintage ceramic 13-ounce mug stands 6 1/2-inches tall. This mug is often referred to as the “Geisha Girl” tumbler. On the front is an Asian/Japanese woman wearing a green kinomo and a fuschia hat. On the back appears to be Kanji script. On the bottom is imprinted “Orchids of Hawaii”, “Japan”, and “R-98″. 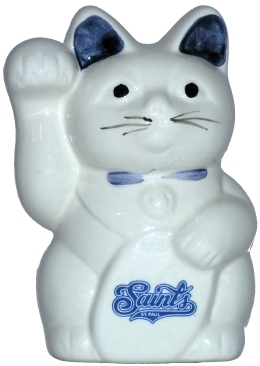 These two Maneki Neko coin banks have a St Paul Saints, a local baseball team, logo on their front. On the back is an Ichiban Japanese Steak House & Sushi Bar logo. These were given away in 2005 at a St Paul Saints game by Ichiban Japanese Steak House. Maneki Neko translates to “Beckoning Cat” or “Welcoming Cat”. These Maneki Neko have their right paw raised which means they are inviting good fortune or money. If a left paw is raised, it is beckoning customers or people. Also, like the Japanese and unlike Americans, Maneki Neko beckons with its palm forward. The color of Maneki Neko is significant also. In the case of these, the white color signifies purity. Gold means it is inviting gold or money. A black Maneki Neko, unlike black cats, are wards against evil. Three-colored Maneki Neko are good luck charms. Found in the Figurine, Labeled, and Orientalia Collections. This mug depicts Tanuki, the Japanese God of Restauranters. Tanuki is holding a bottle of sake in his right hand and a promissory note for the sake in the other. He has a big fat belly, large testicles, and is wearing a straw hat. Tanuki has the power of transformation which it uses to play tricks on people. It also loves sake, which is why it has a bottle of sake in one hand. There is an small hole in front of this mug for a straw and a large hole in the back for adding a beverage. Inscribed on the bottom is “Japan”. 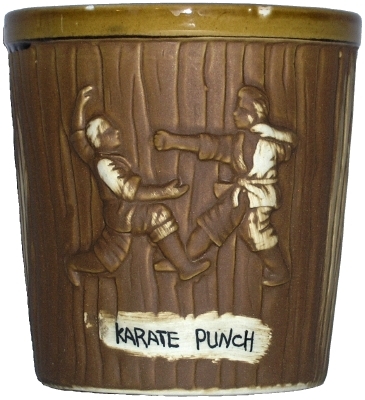 Similar items in my collections include the Benihana Tanuki Mug. This mug depicts Tanuki, the Japanese God of Restauranters. 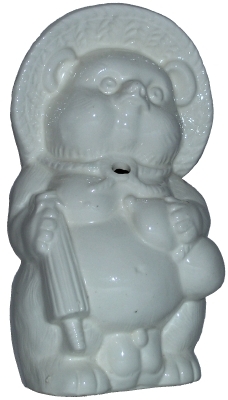 Tanuki is holding a bottle of sake in his left hand and an umbrella in the other. He has a big fat belly, large testicles, and is wearing a straw hat. Tanuki has the power of transformation which it uses to play tricks on people. It also loves sake, which is why it has a bottle of sake in one hand. This hand-painted ceramic mug features, in bas-relief, a buxom, dark-haired woman wearing a red kimono with white flowers on it. She has a headdress of yellow flowers and a bracelet on her left wrist. She is standing, against a tan background, on green grass with yellow flowers on vines in the background. On the base of the mug in white lettering is “Tommy Bahama”. On the bottom of the mug is “Tommy Bahama”, “Kimono Lady”, “2002″, and “Hand Made in China”. Also, impressed on the bottom is the letter “W”. Tommy Bahama has released a series of mugs featuring a wahine, one each year, since 2002. 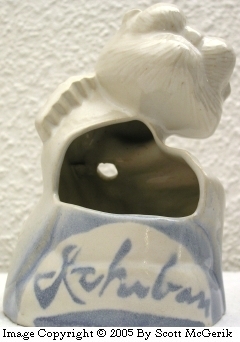 This mug, titled “Kimono Lady”, was released in 2002. Others include “Tropical Nostalgia“, released in 2003, “Vacation Vixen“, released in 2004, “Just Duet” in 2005, and “Paradise Beach” in 2006. Found in the Mug, Orientalia, and Tommy Bahama Collections.